GSB0013 is GSB0011 covalently linked to biotin.GSB0011 specific to human kallikrein 1 (hK1) can greatly improve the effectiveness of several different kinds of immunoassays, such as ELISA, Western blot and Dot blot. GSB0011 is produced from the hybridoma which is fusion of Sp2/0-Ag14 mouse myeloma and B-lymphocytes obtained from mouse. After hundreds of selection cycles, our researchers successfully isolated an antibody against hK1 with high specificity and sensitivity. GSB0013 is produced by GSB0011 (biotin-coupled). The monoclonal antibody GSB0011 is produced by mice immunizing with full length human kallikrein 1, derived from plasma or urine. GSB00013 can be stored for 2-3 weeks at 2-8°C. For long term storage, store at -20°C. GSB0013 is stable for one year if stored at -20°C from the date of shipment. 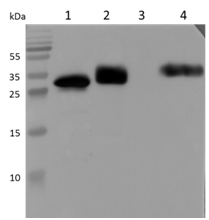 Western blot analysis of two kinds of recombinant proteins and endogenous protein by GSB0011. Lane 1 is E. coli expressed full length hK1; lane 2 is Pichia pastoris expressed full length hK1; lane 3 is negative control and lane 4 is nature hK1 derived from urine.GSB0013 is GSB0011 covalently linked to biotin.